Qu-bit Electronix, the makers of the now infamous Nebulae eurorack sample-player module, have released a new video tutorial about their new performance module, the Tri-ger. Basically a clock and gate generator, the arcade game-style buttons make the Tri-ger an irresistible attraction for the hands. Each button on the Tri-ger is routed to one of three gate outputs. These can be used to trigger drum modules, envelopes, clock modules and more. Tri-ger also features a pattern recorder, so you can record your button sequences and play them back based on the internally generated clock or clocked by an external source. 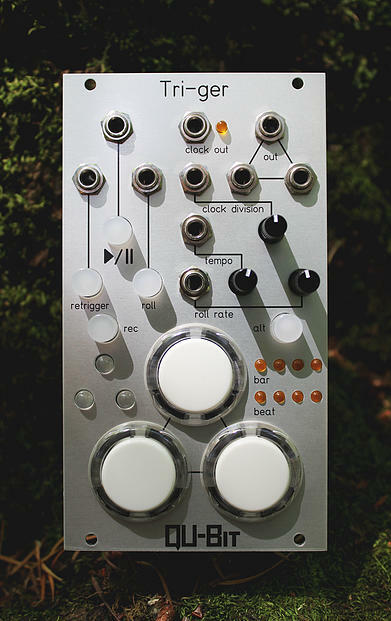 Tri-ger also features a clock divider which generates a tempo based on the recorded pattern tempo. The Clock Division knob and output then become a clock divider and multiplier, depending on the knob position during recording. Another control, the Roll knob, also acts as a clock multiplier but generates the additional gates at the button gate outputs, creating a buzz or roll effect at the destination when the Roll button is engaged. All of the CV inputs add voltage to the current knob settings. The video demonstrates some of the advanced and hidden features in the Tri-ger. Using an “Alt” button, the other buttons on the panel shift to perform additional unlabeled functions, including mute, roll mute, and more. We also see some best practices for setting certain knob values for the most flexible performance, such as setting the Tempo knob to 12 o’clock when recording patterns to allow for a wider range in tempo shifting. What kind of modules do you use to get your hands on your modular performance? At $390 retail, does the Tri-ger seem like a sensible addition to your setup?